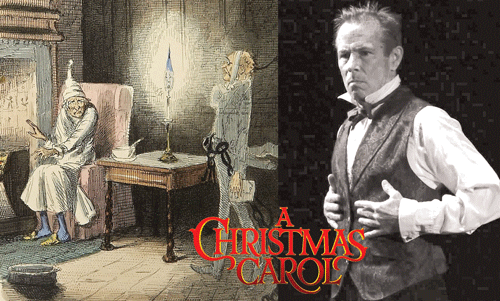 The Charles Dickens classic A Christmas Carol has long haunted actor-writer-director John Hardy. Though ghosts have yet to visit him ala Scrooge, the story’s held an enchanted place in Hardy’s heart ever since he got his Equity card acting in a professional stage version. Joslyn Castle is located at 3902 Davenport Street. The festival includes lectures, concerts and other Dickens-themed events. But Hardy’s one-man Carol stands apart. In his energetic show he assumes more than 40 roles across a spectrum of Victorian and Industrial Age archetypes. The well-traveled Hardy is no stranger to Omaha. He performed his other one-man play, Rattlesnake, here. He directed Othello at this past summer’s Nebraska Shakespeare Festival. Able to pick and choose his projects, he’s reached a golden period in his performing life. But getting there took years of searching. This native of Texas grew up in New Jersey and got bitten by the theater bug attending plays in New York City. He studied drama and stagecraft under his muse, Bud Frank, at East Tennessee State University. He no sooner graduated then went off to do the starving acting bit in the Big Apple, making the rounds at casting calls and booking work on stage and screen. A stated desire to create “my own opportunities” led him to Calif., where he co-founded a theater. Then he earned a master of fine arts degree at the University of Alabama, where he started another theater. He soon established himself a director and acting coach. Once fully committed to following his own creative instincts, his original one-man play, Rattlesnake, emerged. In casting around for another one-man play, he returned to his old friends, Dickens and Christmas Carol. “As much as I had done it, I always felt like there was something else there. I wasn’t quite sure what it was. But there’s a reason why that play is done and why that book’s become a play and become so many movies. I feel like people were searching for it, just as I was, too. Tried and true is fine, but Hardy imagined a fresh take on the classic. The more Hardy dug into the book and play, the more he discovered. He believes Dickens possessed insights rare even among great authors or dramatists in exploring the experiences that shape us, such as the transformative powers of forgiveness, humility and gratitude. “It’s a thrill to have anything to do with Dickens or talk about him. Dickens is just one of those people like Shakespeare that seems to have a window into the human experience that few people have. The more we get to know about ourselves through his work then the closer we get to not killing ourselves and I would like to participate in that endeavor,” he says. In his one-man show Hardy is our avatar embedded in the story. He embodies the entire gallery of characters immersed in this fable of redemption. As he moves from one characterization to the next, he seductively pulls us inside to intimately experience with him-them the despair, tragedy, fright, frivolity, inspiration and joy. Because this is Hardy’s vision of Carol, he can play the omnipresent God who let’s us see and hear things not in the original text. Hardy’s well aware he’s doing the show in a place with a special relationship to the Dickens drama. The Omaha Community Playhouse production of Charles Jones’ musical adaptation is a perennial sell-out here and in cities across America where the Nebraska Theatre Caravan tours it. Hardy auditioned for the Caravan himself one year. His one-man homage kicks off “Dickens at the Castle” on November 14 at 6:30 p.m. A pre-show panel of local theater artists, plus Hardy, will discuss adapting the novel. For dates-times of Hardy’s other performances of Carol during the fest and for more event details, visit http://joslyncastle.com/. Banding together to celebrate our heritageWhat’s In Your Food?